We also offer a wide range of Silicon Extruded Door Gaskets in different shapes and designs. (In round and square types). 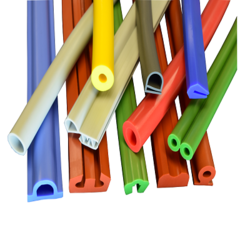 These extruded door gaskets are made from Food-Pharma grade Pure Silicone Rubber which can easily withstand a temperature range of -80° C to +250°C. Keeping track of latest market development, we are devotedly engaged in providing an extensive range of Oven Gaskets. We are a prominent Manufacturer, Exporter and Supplier of Coke Oven Gaskets. The Coke Oven Gaskets are manufactured with advanced technology to ensure long life. The Coke Oven Gaskets are stringently tested for optimum performance. Our range of Inflatable Seals are made from high strength FDA approved transparent silicon rubber. These gasket provides an electrically conductive seal between conductive sections of a shielding enclosure. Application : Used for sealing, these gaskets are mostly used in application where contamination is not acceptable.